Last week, I introduced this series about the amazing year in the life of Noah – the year of the Flood. Today we will begin looking into the details given to us from the pages of Scripture. Note: a detailed illustration of the following timeframe is available on our website. To begin, in the 600th year of Noah’s life, after the Ark is complete, it is God who enters the Ark first and invites Noah and his family to join Him with the message to “come into the ark” (Gen 7:1, 7:6). Noah, his family, and the animals board the ark (Gen 7:13 – 16). The Lord Himself is then the one who “shut him in” the ark (Gen 7:16). 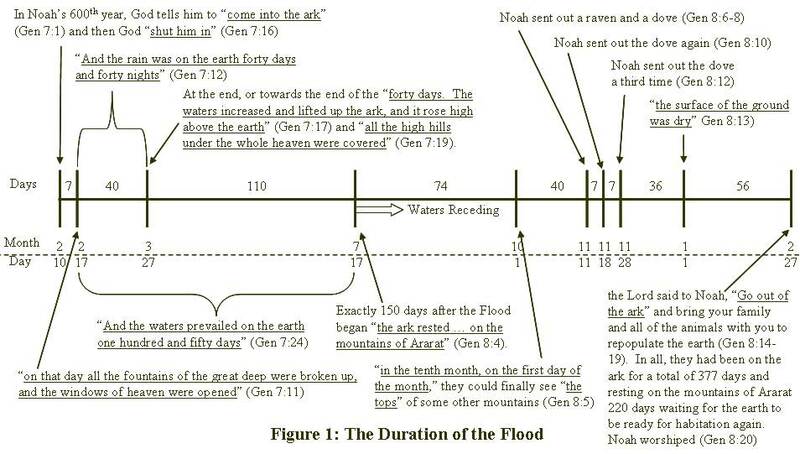 Seven days later the Flood begins (Gen 7:4, 7:10). The time was “In the six hundredth year of Noah's life, in the second month, the seventeenth day of the month, on that day all the fountains of the great deep were broken up, and the windows of heaven were opened” (Gen 7:11). The Lord was the one to “cause it to rain on the earth forty days and forty nights” (Gen 7:4, 7:12). At the end, or towards the end of the “forty days. The waters increased and lifted up the ark, and it rose high above the earth” (Gen 7:17). Therefore, after 40 days, the ark “moved about on the surface of the waters” (Gen 7:18). The waters prevailed so high that “all the high hills under the whole heaven were covered” to a depth that would allow the ark to safely clear their tops (Gen 7:19-20). So the “mountains were covered” (Gen 7:20). The waters continued on the earth for another 110 days, so that the total time the Flood “prevailed” was “one hundred and fifty days” (Gen 7:24). God made a “wind to pass over the earth” (Gen 8:1). Also, the fountains of the deep were stopped, the rain had stopped, and at the end of the 150 days, the “waters decreased” (Gen 8:2-3). Exactly 150 days after the Flood began “the ark rested … on the mountains of Ararat” (Gen 8:4). This was “in the seventh month, the seventeenth day of the month” (Gen 8:4). Everyone stayed on the ark as it rested on the top of the mountain while “the waters decreased continually” (Gen 8:5). After 74 more days, “in the tenth month, on the first day of the month,” they could finally see “the tops” of some other mountains (Gen 8:5). Noah waited yet another 40 days, then “opened the window of the ark” and sent out a raven and a dove (Gen 8:6-8). The raven “kept going to a fro,” but the dove came back to Noah (Gen 8:7-9). Seven days later, Noah sent out the dove again and this time it came back with a “freshly plucked olive leaf,” indicating the “waters had receded” and vegetation was now growing on the earth (Gen 8:10-11). Another seven days later, Noah sent out the dove a third time and it did not return (Gen 8:12). I hope you will join me next time as we conclude this look into this incredible year of Noah’s life.